Yay! I just looked and all three of my favorite Judy Holliday movies are on DVD. They are: Born Yesterday, Bells Are Ringing and It Should Happen To You. Born Yesterday is even available for instant play on Netflix. It seems like Americans tend to immortalize the stars who die young- we all remember Rudolph Valentino, James Dean, Marilyn Monroe, Jean Harlow. But someone very important was left off of this list. Her picture isn't silkscreened on t-shirts, her movies aren't standard fare for anyone intersted in old films, her name isn't a symbol of American super-stardom. But Judy Holliday was a star, and unfortunately she did die young. Judy Holliday made only 9 films- and even in that short film career, she won an Oscar for her portrayal of Bille Dawn in Born Yesterday, beating Bette Davis in All About Eve and Gloria Swanson in Sunset Blvd! She often played screwy blondes. A lot of Judy Holliday biographies call her roles "dumb blonde" roles, but I think it was more "screwy" or "goofy." Take for instance her character in It Should Happen To You. She plays a woman who thinks she can become famous by painting her name on a billboard, and she takes off her shoes whenever she needs to think deep. It's not a dumb role, just sort of screwy. Her character in Bells Are Ringing (which was written for her by her friends Betty Comden and Adolph Green) is a telephone answering service operator who gets too involved in the lives of her clients. It's so much fun to watch this, because Comden and Green based the character on the personality of Judy Holliday. She is a sweet, well-meaning, altogether friendly woman who just wants to make everybody happy. It's also sad, though, because it was her last film. A few years later, Judy Holliday died from cancer. She was only 43 years old when she passed away. 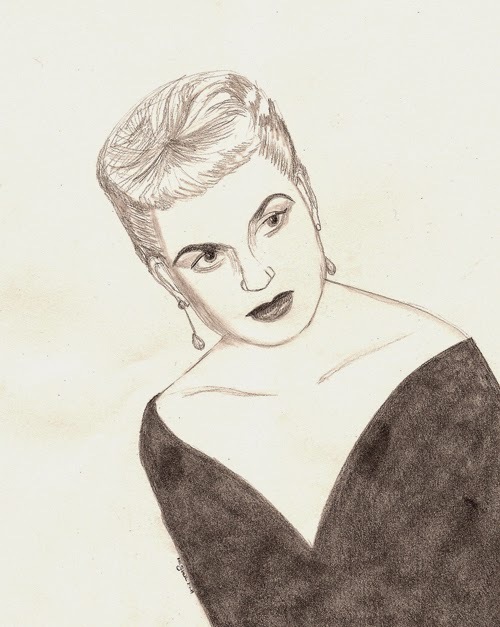 Judy Holliday's films have stood the test of time, and I wish so badly that she had remained as popular as someone like James Dean or Marilyn Monroe. So many people have missed out on her comedic brilliance and her genius (she actually did have a genius IQ!) because time has neglected to remember her. Do yourself a favor and rent one of the movies I listed above. Born Yesterday co-stars William Holden, Bells Are Ringing co-stars Dean Martin and It Should Happen to You co-stars Jack Lemmon in his film debut! I'm in the middle of watching It Should Happen to you and absolutely love it. I wish that she was remembered as well as James and Marilyn. She certainly deserves it. It this is definitely the most beautiful I have ever seen Judy portrayed! Millie- Thanks so much :) And I think the soundtrack in Bells Are Ringing is one of my favorites of any movie musical. Some are really fun (like I Met a Girl) wacky (the name-dropping song) and then sad, like The Party's Over. Such wonderful songs!